It had to happen. Despite achieving a 10-1 record and occupying the top spot in most NFL power rankings, the Eagles were bound to lose a game. As I said on Eagles Postgame Live after the loss to Seattle, even Clayton Kershaw gives up three or four home runs once in a while. Even the great 2004-2005 Super Bowl team had one clunker when the Pittsburgh Steelers abruptly put an end to their undefeated season. But nonetheless, many Eagles fans have started to panic, and across the Delaware Valley last Sunday night there was a faint sound that started to grow louder and louder — the thud of many Birds fans jumping off the bandwagon. Even though the Eagles' 10-2 record still puts them in an incredibly advantageous playoff position, the naysayers are now in fear of an outright collapse. Despite all of this, and somewhat unsurprisingly given my de facto role as Philadelphia cheerleader and Eagles optimist, I am confident the Birds will continue to win and that they have a good chance of making the Super Bowl. To preserve their prime position and avoid doing serious damage to their chances to win it all, however, the Eagles must win Sunday's game against the Rams (in other words, I'm calling this a MUST WIN game). If they were to lose in LA, their firm grip on a first-round bye would loosen considerably, and it would become a real possibility that they would need to win three games to get to the Super Bowl instead of just two. Although this season may have convinced us otherwise, even regular-season wins are hard to come by, and winning three straight games against the best of the best in January is a truly daunting task. However, as I see it, if the Eagles simply do one relatively easy thing I believe they will be able to beat the Rams handedly and right the ship (from the ever so slight tilt caused by the Seahawks loss, that is). All they have to do is go back to playing Eagles football. The 2017 Eagles became the surprise of the NFL by playing an aggressive, swashbuckling, no-holds-barred brand of football both offensively and defensively. The Birds' D attacked quarterbacks aggressively and maintained a narrow focus on relentless disruption. They never sat back and waited for the offensive to unfold, but successfully became the aggressor at all times. On offense, the Birds never played it close to the vest and were equally aggressive, going for it on fourth downs when caution would have dictated punting. 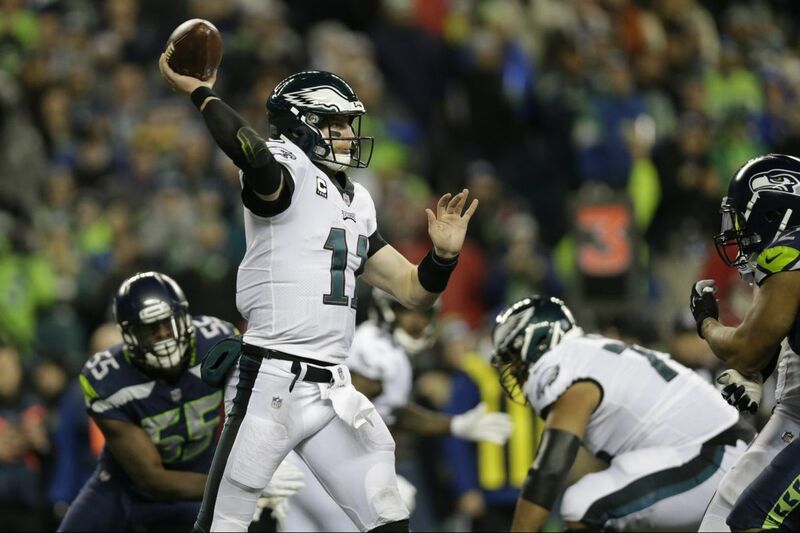 The game plan was unpredictable, and often relied on the uniquely talented and amazing young quarterback Carson Wentz to do the unexpected when it looked like he was trapped for big losses. But inexplicably, Doug Pederson, his staff and players seemed to take their collective foot off the pedal when they came out as conservative and as timid as can be against Seattle. The defense sat back and waited for the Seattle offense to make its move. On offense, it looked like the Eagles were playing not to lose. Consider that in the first half, Wentz passed only nine times for a grand total of 45 yards, and only one of those targets went in the direction of our two most prolific receivers, Alshon Jeffery and Zach Ertz. By the time Doug decided to open up the offense in the second half, it was just too late to complete the comeback against a desperate Seattle team determined to win. God only knows why the Eagles became so timid, cautious and meek, but the prescription for a successful game against the Rams is simple: Let the Birds be birds, but this time Birds of prey. They must go back to the approach that made them the surprise of the NFL – attack, attack, attack! Rams QB Jared Goff must face constant pressure if the Eagles hope to disrupt this high-powered LA offense. The offense must set the tone by playing a physical, smash-mouth style using the bevy of punishing running backs to wear out a Rams defense particularly weak against the run. If the Birds play with reckless abandon, throw caution to the wind and literally fly around the field as they did while winning nine in a row they'll roll over the Rams and be back on the road to Minneapolis.